Dubai is well known for providing favorable business opportunities for people around the world. For this reason, it has a respectable place not only in the GCC area but around the globe. Almost all types of businesses are flourishing in Dubai and their numbers are increasing steadily. With the passage of time, the situation has improved further with growth of new businesses in Dubai market. It is mainly due to new developments on national and international levels. There are few businesses that were known to provide maximum profits to owners in the past but now aren’t so attractive anymore. It is due to tough competition in the market, introduction of VAT (value added tax), adoption of new policy by government (e.g. converting economic policy from oil-based to knowledge-based) and several other reasons. Instead, there are few new businesses that are emerging in Dubai and we can expect them to flourish in 2018 and beyond. Apart from that, there are few already trusted businesses that have lot of potential in Dubai in future as well due to large opportunities and extensive support from the government. Listed below are few such important businesses where investors should consider seriously in 2018 and beyond for better growth prospects. Hospitality and tourism is one of the most important sectors in UAE. It was an important sector even before the introduction of new economic policy. After the adoption of new knowledge-based economy, the importance of this sector has increased further. Every year, millions of tourists arrive in Dubai. Entertainment sites like beaches, luxury hotels and cultural attractions are important for many tourists. But all these tourists don’t visit Dubai merely for entertainment. The scope of tourism has increased recently due to growth of few subsectors of tourism like halal tourism in Dubai and medical tourism. These activities open doors for all types of businesses related to tourism including travel agencies, hotels etc. The government is fully aware regarding importance of this sector and now VAT returns for tourists is allowed in UAE. After seeing the steps taken by government, we can safely assume that future of hospitality and tourism industry in Dubai is very bright. The sector that directly benefitted from latest economic approach of government of Dubai and UAE is science & modern technology. In recent years, several steps have been taken in transforming manual system to latest technology in different government institutes. Different departments under the government of Dubai are first and most vigilant to adopt this latest technology. An example is the introduction of world’s first robot police officer in Dubai. There are also few free zones in Dubai designated for modern technology like Dubai Science Park and Dubai Internet City. The adoption of latest technology in government departments and private organizations is certainly increasing chances for growth of companies related to latest technology. There is no doubt that the use of modern technology will increase further with the passage of time. Dubai is trying to adopt policies according to developed world and there is no chance that the use of latest technology will diminish in near or even far future. Therefore, any business that provides goods and services related to modern technology has bright future in the market of Dubai. 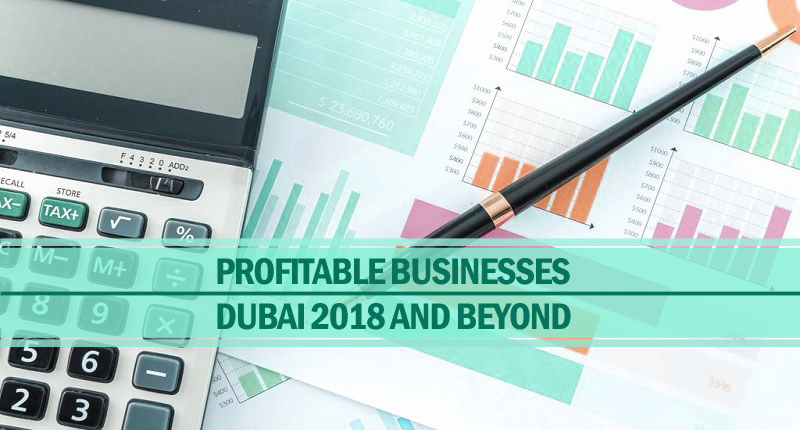 It is another business activity that has a high demand in Dubai since past several decades and it seems this sector will thrive in future as well. The construction work is always underway in Dubai for various large and small projects. A recent example is Dubai South that has been constructed for hosting upcoming Expo 2020. Apart from that, several projects related to tourism (parks, artificial islands etc.) are constructed as a measure to entertain residents and tourists along with creating new business and job opportunities for masses. It also has been proved that construction sector is booming in Dubai despite VAT. Therefore, real estate and other such businesses have nothing to fear about anything as they are more likely to gain profits in 2018 and beyond also. As stated above, Dubai is becoming a favored place for people from all around the globe for medical tourism. An important factor behind this achievement is the availability of one of the world’s best medical facilities at affordable cost. It has been made possible due to seriousness of Dubai government and economic conditions of Dubai. With the increase in quality of medication, it is expected that medical tourism will increase several folds in coming years. Apart from that, local and expat population in Dubai are happy to spend something extra to get best health facilities. It clearly describes the scope of business related to health and fitness in Dubai in coming future. Another very lucrative business that is expected to bring huge profit to investors is that of retail shop. Reasons behind expected growth in this business are large population of Dubai that is increasing constantly, arrival of millions of tourists every year and economic condition of the emirate and its residents. In this scenario, one can expect best advantage by opening any retail business in the emirate.